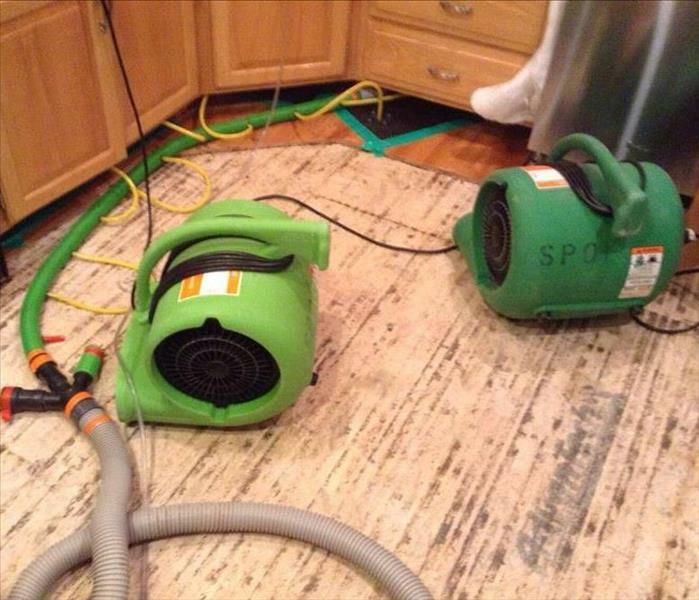 If your Overland Park, KS, home or business experiences water damage, call SERVPRO of Greater Shawnee/Merriam today. Our team can quickly respond and get to work to make sure that your damage is "Like it never even happened." Our SERVPRO of Greater Shawnee/Merriam team is available to respond to your Merriam, KS, residential or commercial water, fire, and mold damage 24 hours a day, 7 days a week, 365 days a year. When disaster strikes your Shawnee, KS, home or business, call the company you can trust. SERVPRO of Greater Shawnee/Merriam has the team and the equipment needed to make any size loss "Like it never even happened." 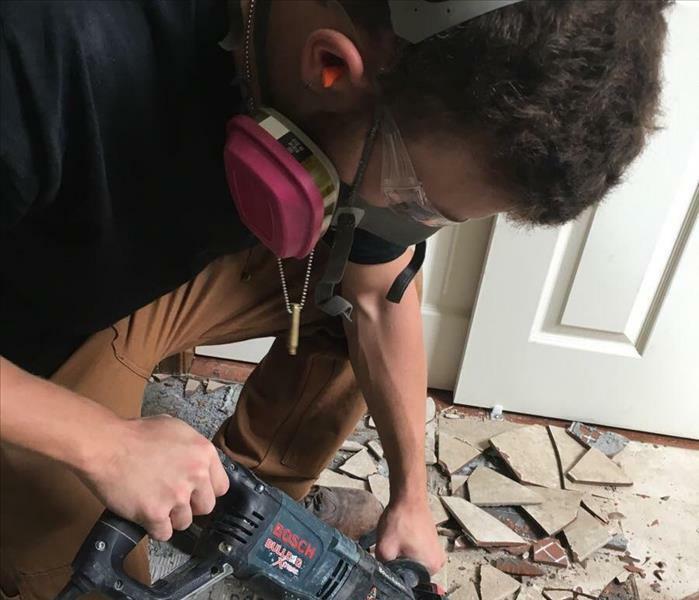 After a leak from the dishwasher, the laminate flooring in this Shawnee, KS, home was ruined. Our team quickly arrived at the scene and began the restoration process to get this home back up and running! After a water loss of any kind, the water will migrate as far as possible. 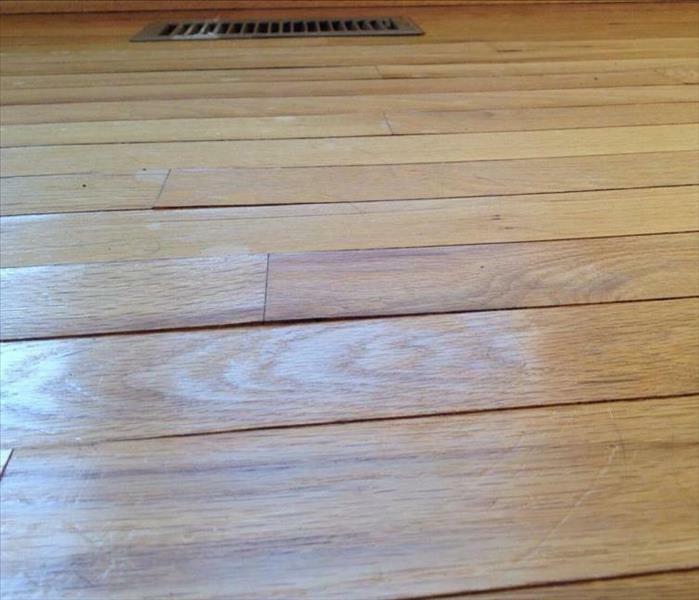 If your floors look like the floors pictured above, you might have a water leak. 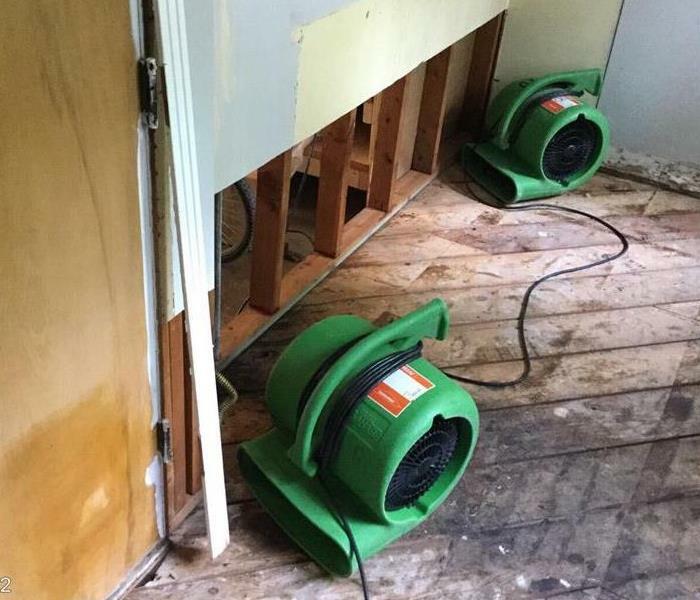 Water damage cleanup and restoration is no problem for our SERVPRO of Greater Shawnee/Merriam team to take care of. Check out these water damage tips and what you can do if your Shawnee, KS, home experiences water damage. 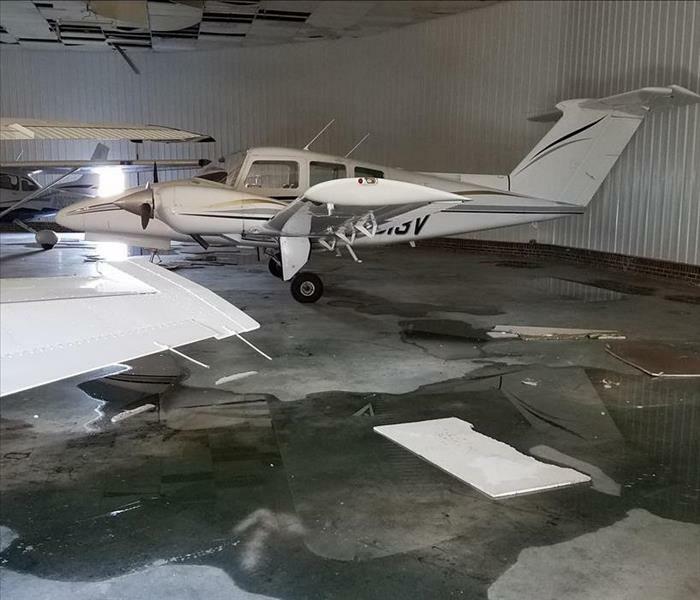 After a messy loss on a commercial property in Shawnee, KS, our SERVPRO team was called to action. 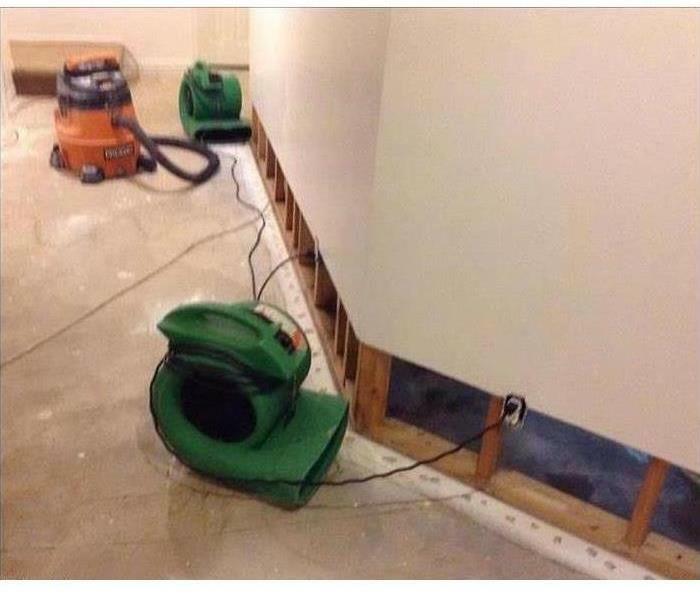 SERVPRO of Greater Shawnee/Merriam has the team with the expertise, experience, and equipment to handle ANY size water damage you experience. SERVPRO of Greater Shawnee/Merriam recently received a call from a local living facility that had discovered mold growth on their property. 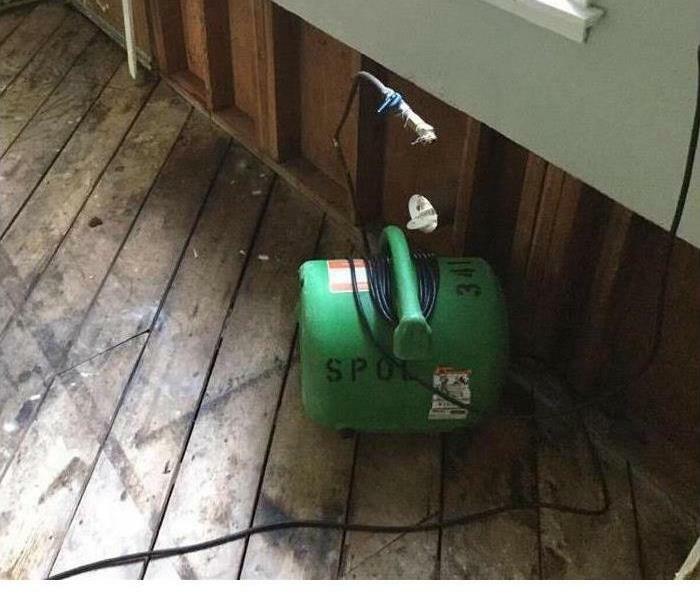 Our SERVPRO team quickly responded and got to work to ensure the mold was properly remediated. Can you spot the water damaged ceiling? Water damage never occurs at a convenient time for you and your family. Our SERVPRO of Greater Shawnee/Merriam team can respond and get to work 24/7/365. SERVPRO of Greater Shawnee/Merriam is always on standby and always ready to respond. 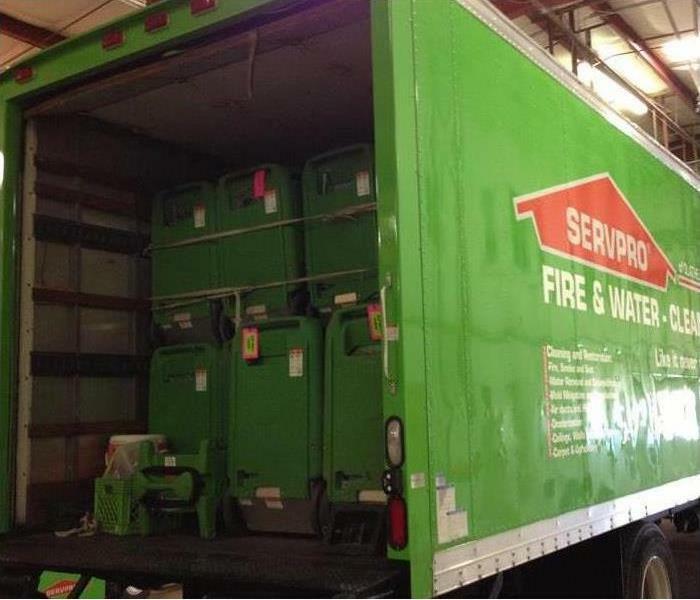 If your home or business experiences fire or water damage, our SERVPRO team is ready to help. Mold can be very harmful to you and the people around you. If you suspect or have discovered mold in your home or commercial property, SERVPRO of Greater Shawnee/Merriam is always Here to Help. If you find mold in your home or business, it is important to call a certified restoration team such as SERVPRO of Greater Shawnee/Merriam as quickly as possible to minimize the spread of mold throughout your property. Our SERVPRO of Greater Shawnee/Merriam team can help make ANY size fire damage "Like it never even happened." 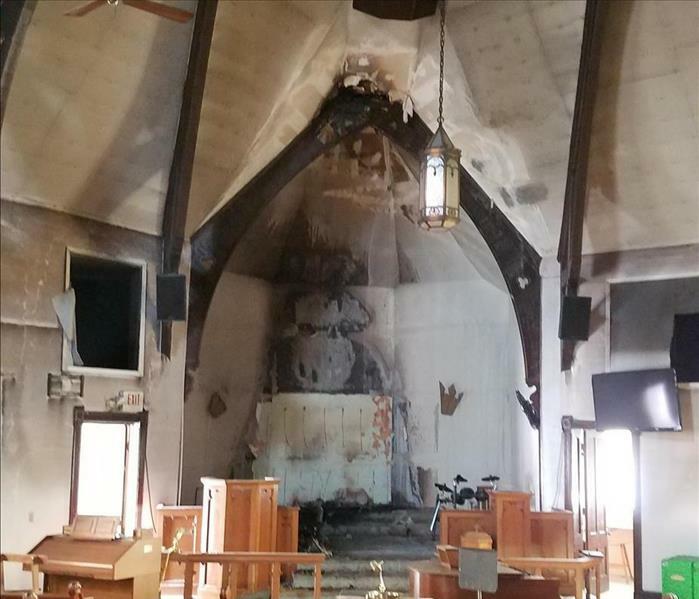 If you experience a fire in your home, business, or in this case, church, give our SERVPRO team a call! 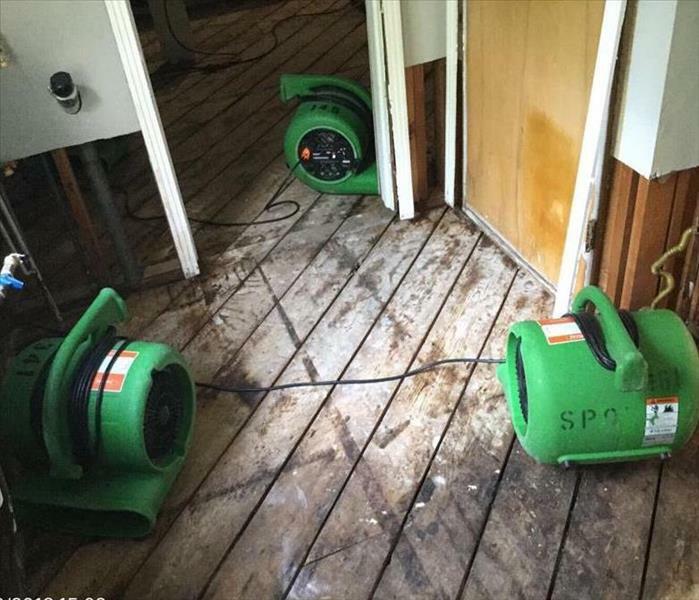 After receiving a call about a large water loss, our SERVPRO of Greater Shawnee/Merriam team responded. 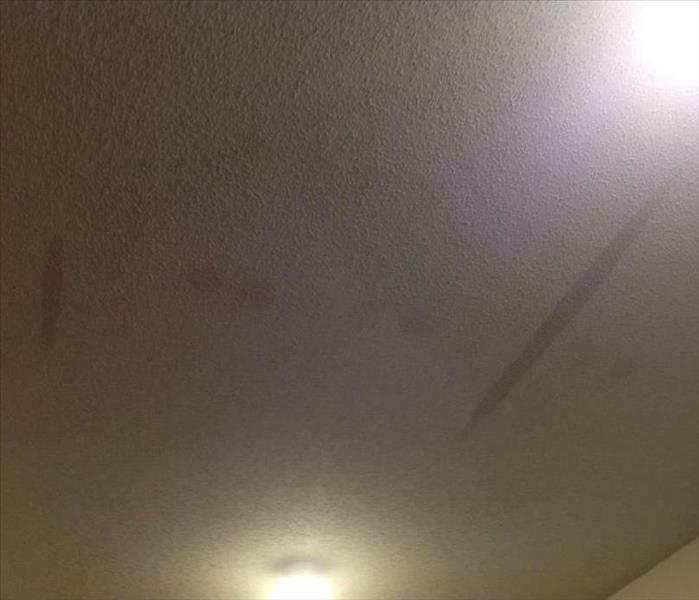 When it comes to water damage, time is crucial! The longer water sits, the more damage will occur. If you experience a residential or commercial water loss, our SERVPRO of Greater Shawnee/Merriam team is Here to Help! When a large commercial water loss like this one occurs, it is important to know who to call. SERVPRO of Greater Shawnee/Merriam has the best team and equipment around, and even better, we are ALWAYS ready to help. After a residential or commercial water loss, locating water can sometimes be tricky. 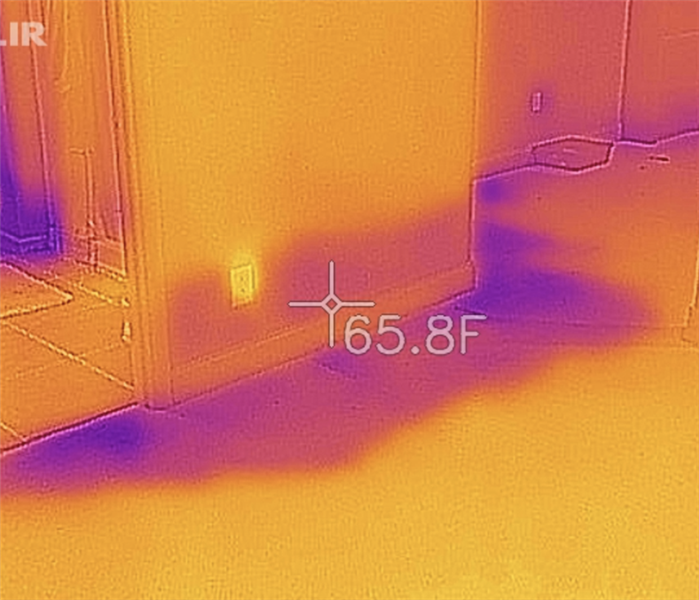 That is why we use our highly advanced thermal cameras to help locate moisture in walls or ceilings. SERVPRO of Greater Shawnee/ Merriam is always ready to respond! After a sewage loss caused severe damage in this Shawnee, KS, home, our crew quickly responded. 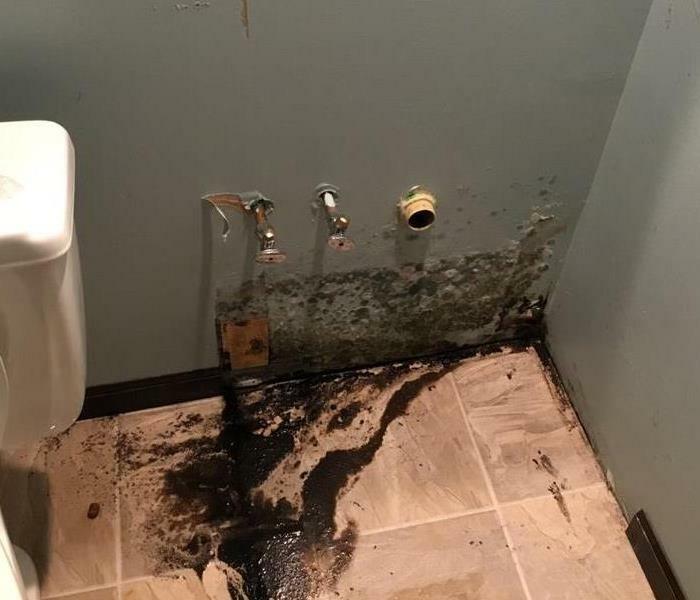 Sewage losses are very harmful and unsanitary and it is crucial to quickly call expert water damage restoration specialists with specific training to safely restore your home or business. OurSERVPRO of Greater Shawnee / Merriam team is Here to Help, 24/7. After our crew removed the water damaged drywall, they got the drying equipment up and running. 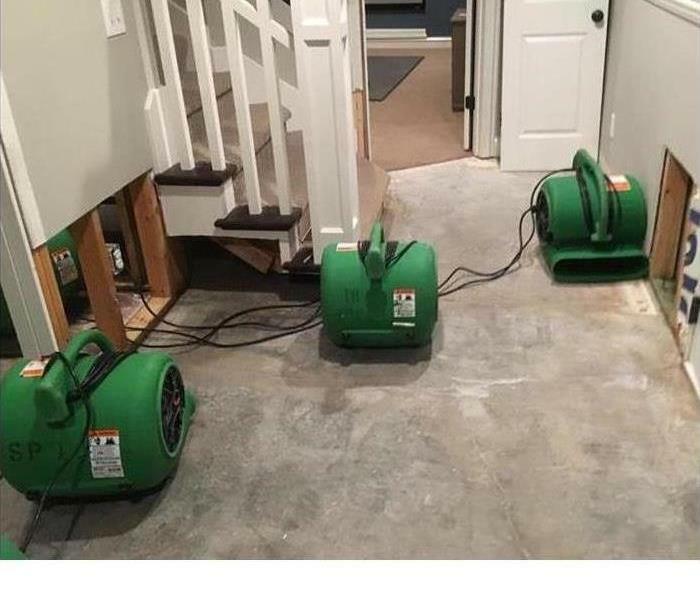 Our SERVPRO of Greater Shawnee/ Merriam team is "Ready for whatever happens" and working hard to make this residential water damage "Like it never even happened." After finding mold in your home there are a million thoughts going through your mind. That is why our SERVPRO of Greater Shawnee / Merriam team is always on standby and always ready to respond. We have the best team and the best equipment around to help make your mold damage "Like it never even happened." This utility room suffered from storm water loss. Flood cuts were performed to help dry the area. Air movers were also put down to help the drying process. After all drying procedures the drywall was repaired and the room was put back together. 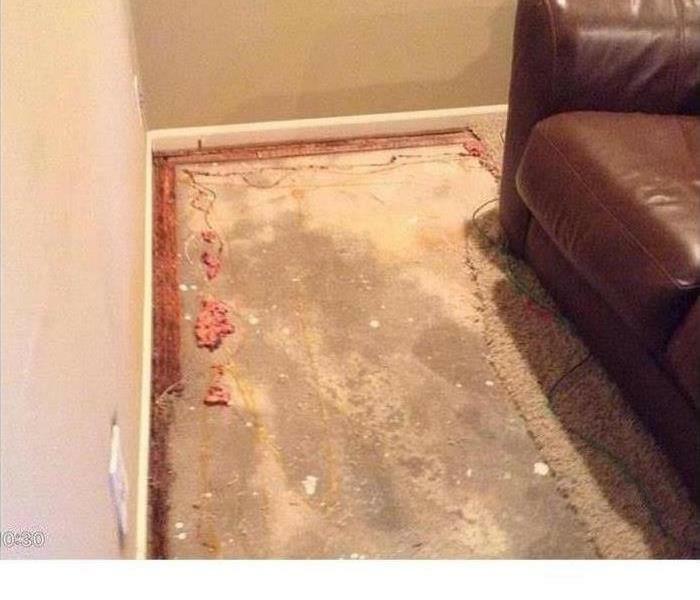 This carpet had significant water stains and damage after storm waters flooded this basement. 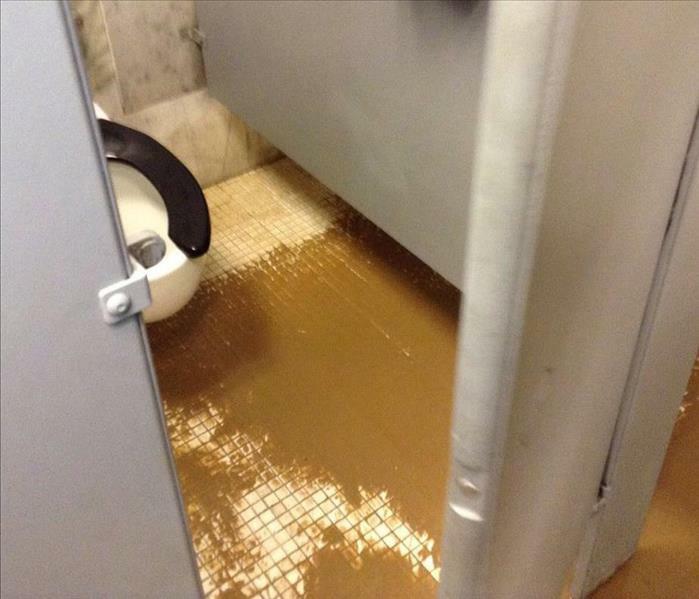 The water was extracted and carpet had to be removed due to the damages. Contact us for your storm restoration emergencies. SERVPRO responded immediately after a storm hit the area. The hardwoods were covered and ruined by the water. The hardwood was torn up and air movers were put in place to dry the subfloors. This is the aftermath of a water loss. There was significant mold growing behind the wall. 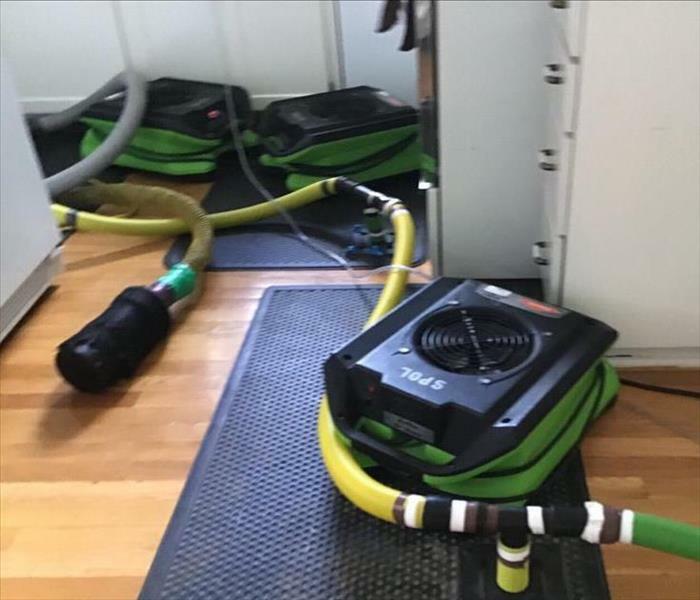 The mold remediation team used air movers to dry the area quickly and was able to clean and treat the area and restore back to pre mold conditions. SERVPRO has special mold cleaning techniques and treatments to ensure your home is safe after finding mold. The mold remediation team treated and cleaned after finding mold on these wall studs. Contact us anytime 24/7 for your Mold Remediation emergency. SERVPRO responded to this home to find mold and mildew damage behind baseboards. The baseboard was removed to clean and treat the affected area. 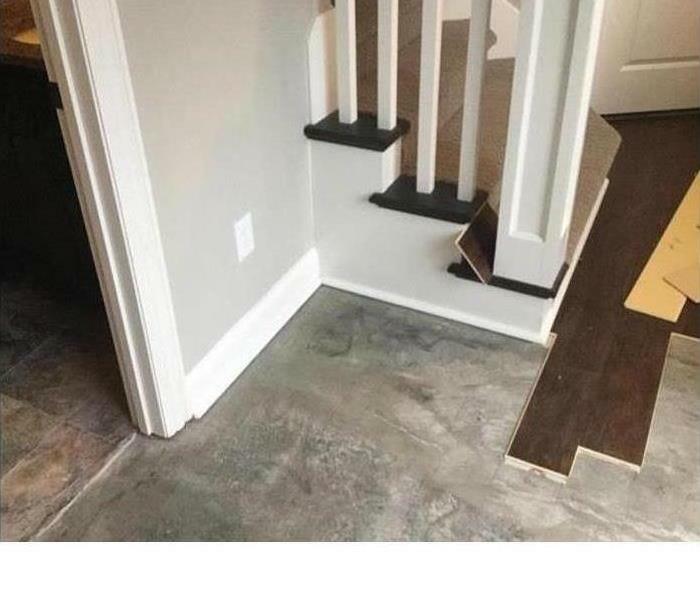 The baseboards were reinstalled and back to normal conditions. 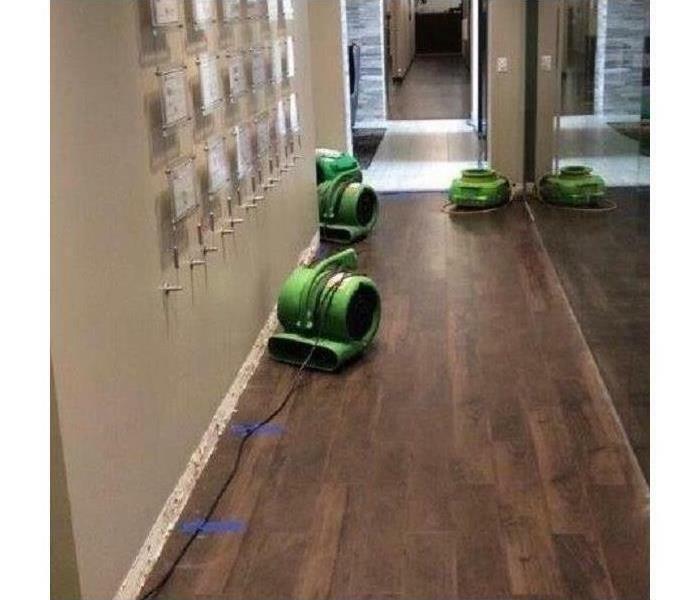 This conference room and surrounding offices suffered from a water loss. There was a significant amount of water. SERVPRO responded and immediately began mitigation procedures. The area was dried quickly preventing mold and water stains. SERVPRO responded to this building to find significant water damage to drywall and flooring. The dehumidifiers were put in place to remove the moisture and humidity from the building helping with the drying. 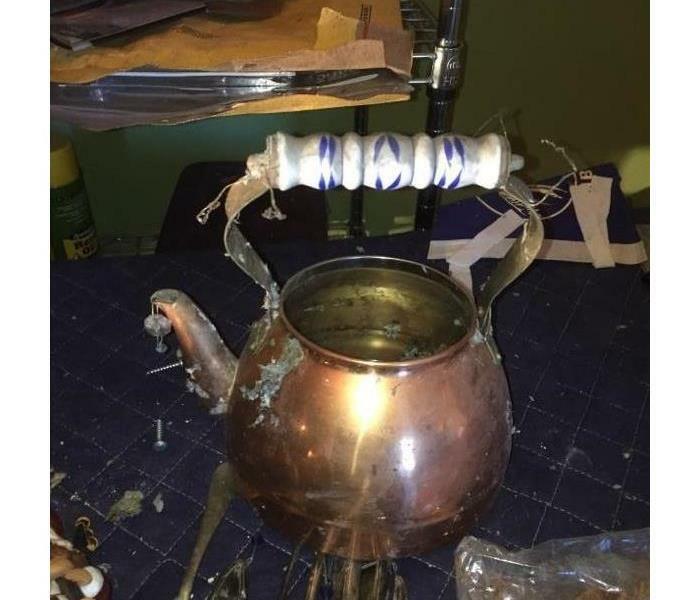 After a kitchen fire, this copper pot suffered from smoke and soot damage. SERVPRO has a facility to take your belongings to for cleaning. 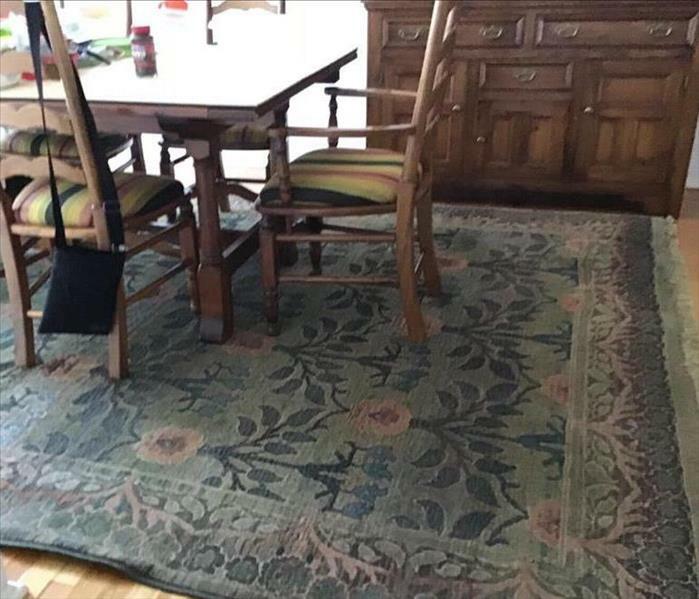 They used cleaning solutions to remove the smoke stains and restore back to normal. After cleaning out the house after a severe fire, we removed the damaged electronics, books, furniture and cleaned them at our facility. After the cleaning we stored in wooden boxes while the home was restored back to pre fire conditions. 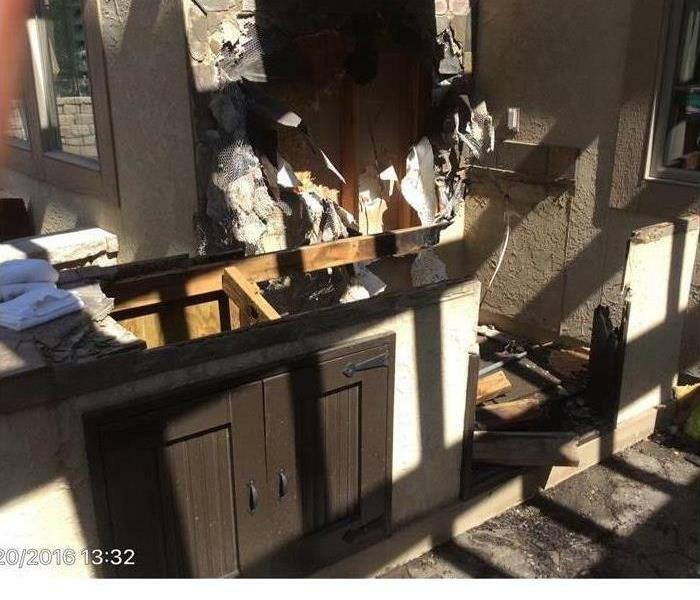 This outdoor area suffered from fire damage. The team at SERVPRO responded and began fire restoration procedures. The area was cleaned and rebuilt cabinets and kitchen area back to pre fire conditions. 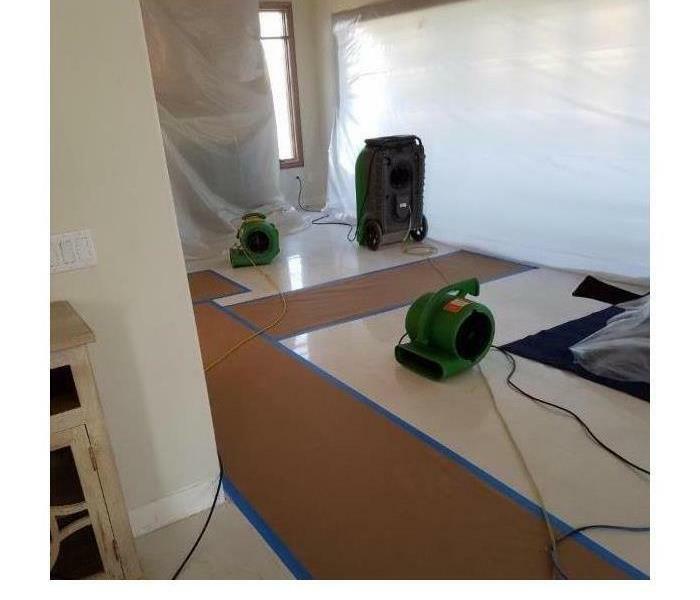 SERVPRO has professional drying equipment and techniques for your water restoration emergency. Contact us anytime 24/7 for your restoration needs. This property was dried quickly and restored back to normal conditions. 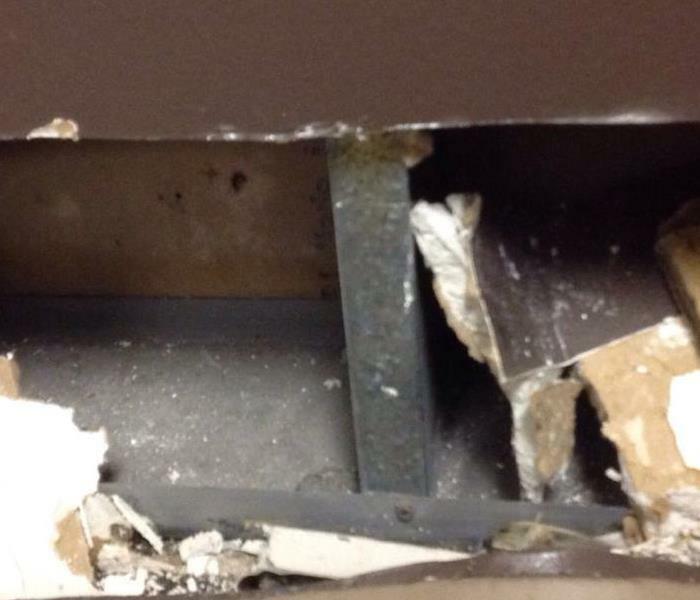 After a pipe break, the drywall and flooring suffered from a significant water damage. 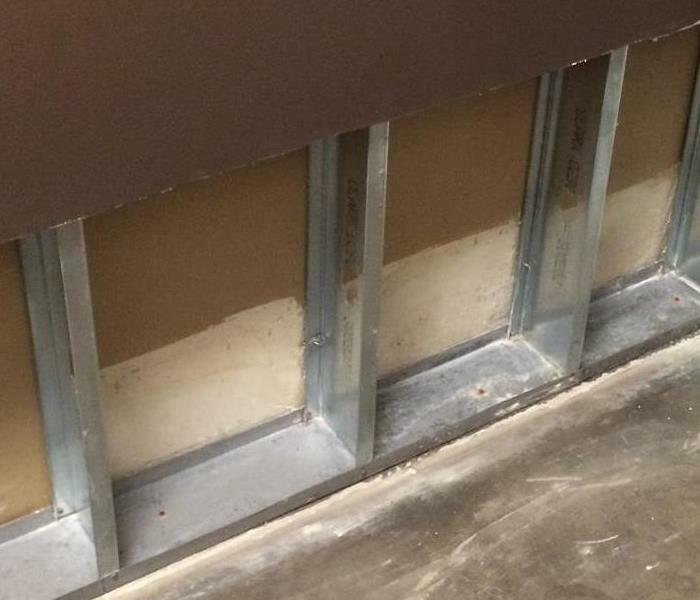 The flood cuts were performed to help the drywall dry properly. Air movers were put in place for drying and repaired back to pre water conditions. 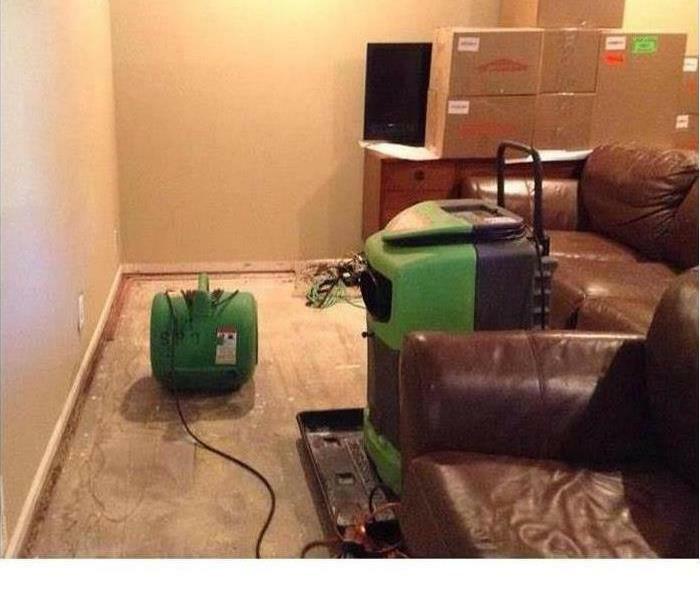 This living room suffered from water damage after a severe storm. SERVPRO responded and began clean up procedures. They packed up the homeowners belongings and removed old flooring and replaced new carpet. Flood cuts were performed after a water loss due to a severe storm hitting the area. They cut out the drywall for drying drywall and studs. The air movers were put down for drying to prevent future damages. After a sever storm hit the area, this entry hardwood was affected by storm waters. 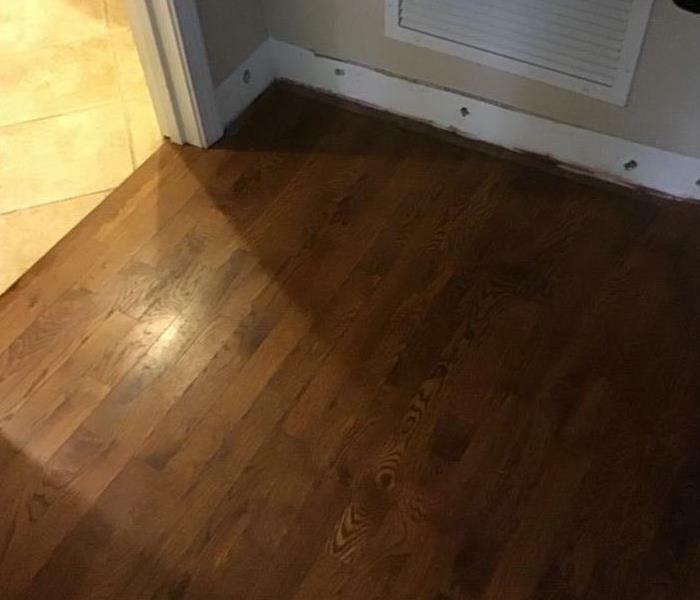 The water had damaged the old hardwood and it had to be replaced. The underlayment was dried and the new flooring was laid. After removing baseboards from this room mold was discovered. 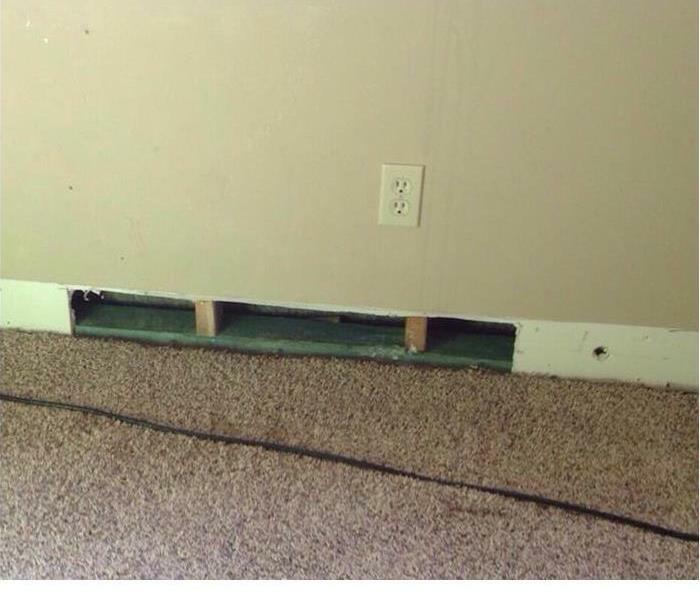 SERVPRO responded and was able to clean and treat the area before replacing the baseboards. For your Mold Remediation contact us anytime 24/7. 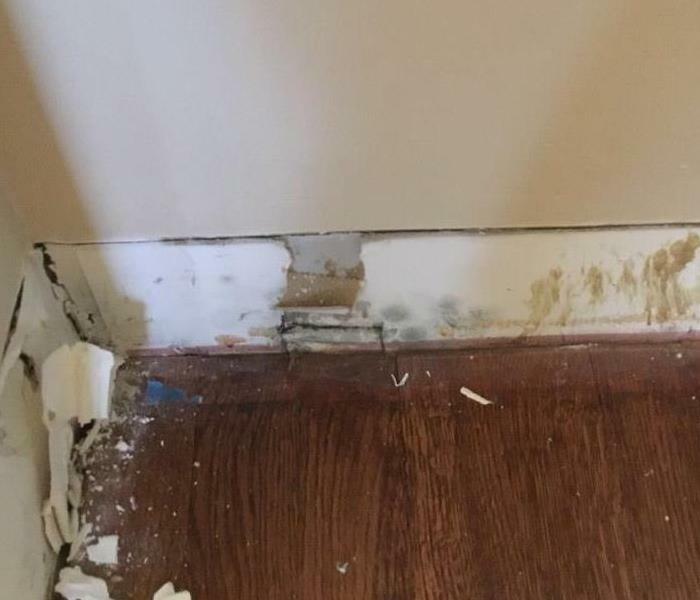 Moldy baseboards can be dangerous in your home or business. Contact SERVPRO for your mold remediation. The team responded quickly to clean and treat the moldy area after finding. The area was cleaned and restored back to normal conditions. 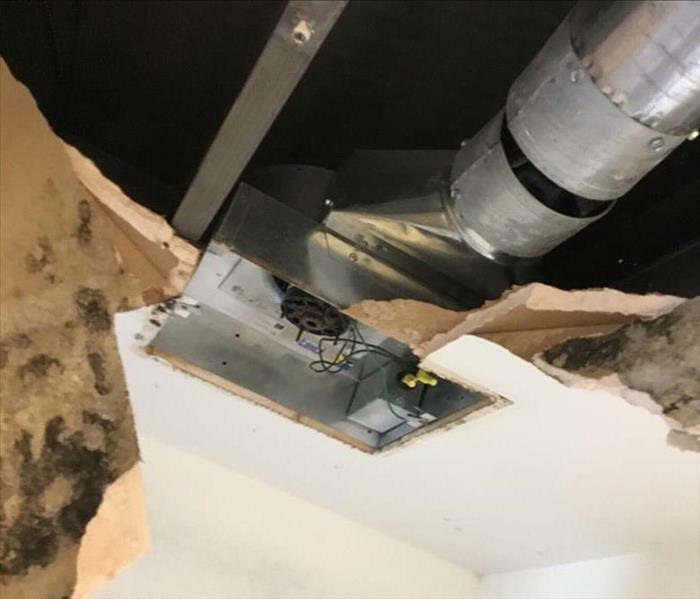 SERVPRO responded to this office to find mold invested in the office space. The team has special cleaning techniques to clean and treat the mold. They set up containment to keep the mold from spreading throughout the space. After a small garage fire, these belongings were left with smoke and water damages. 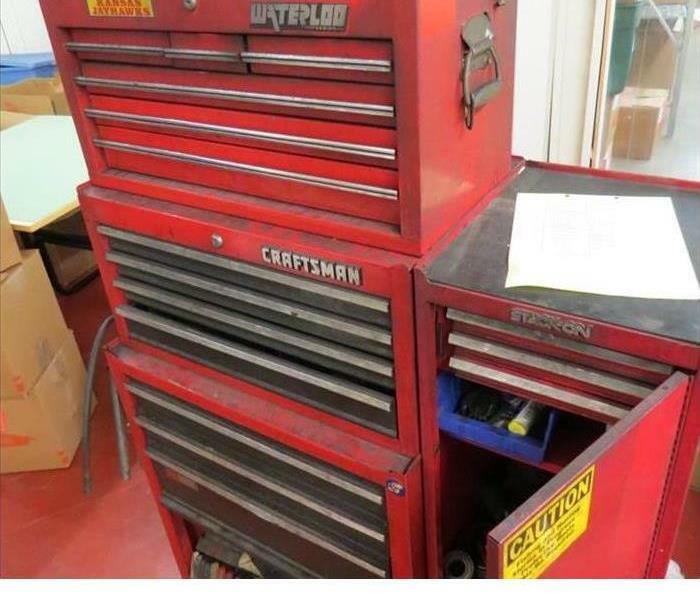 SERVPRO was able to clean the tool box and tools and restore them back to pre fire conditions. For your fire restoration needs contact us 24/7. 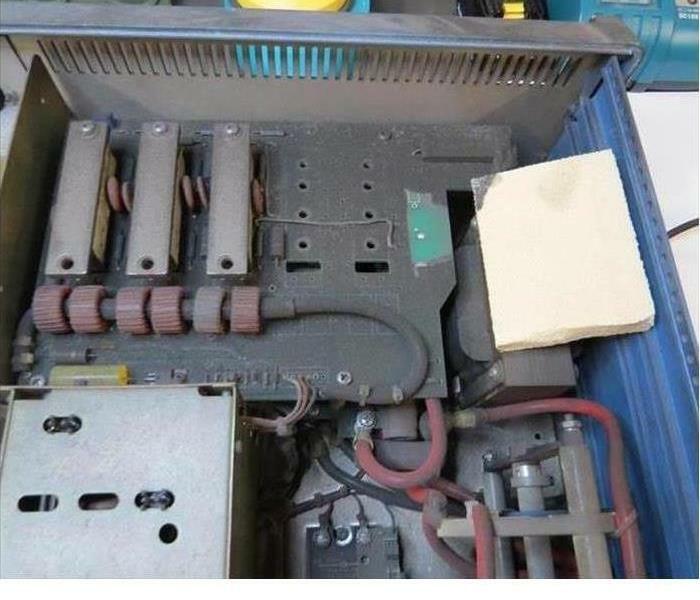 This memory board suffered from a small fire. SERVPRO was able to take the memory board back to their facility and clean with proper techniques. The memory board was reinstalled and working correctly. 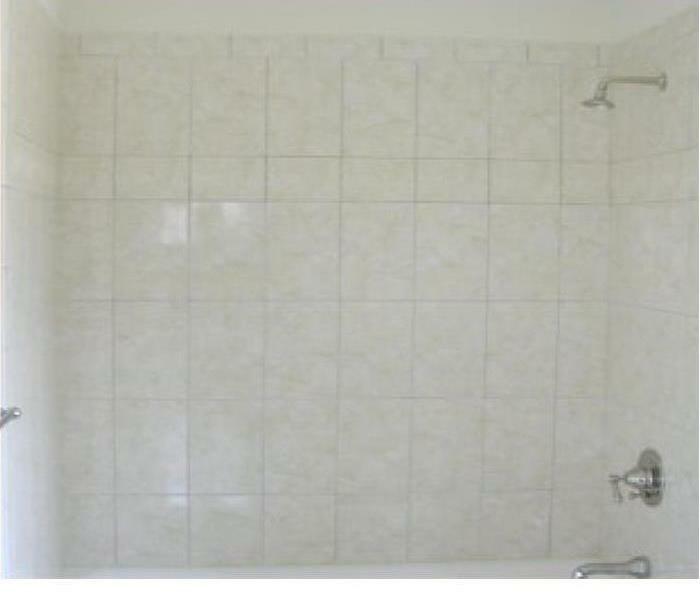 This bath tile had suffered from smoke and soot damages. SERVPRO used cleaning techniques and solutions to remove the smoke and soot. They were able to clean and restore the bath back to pre fire conditions. 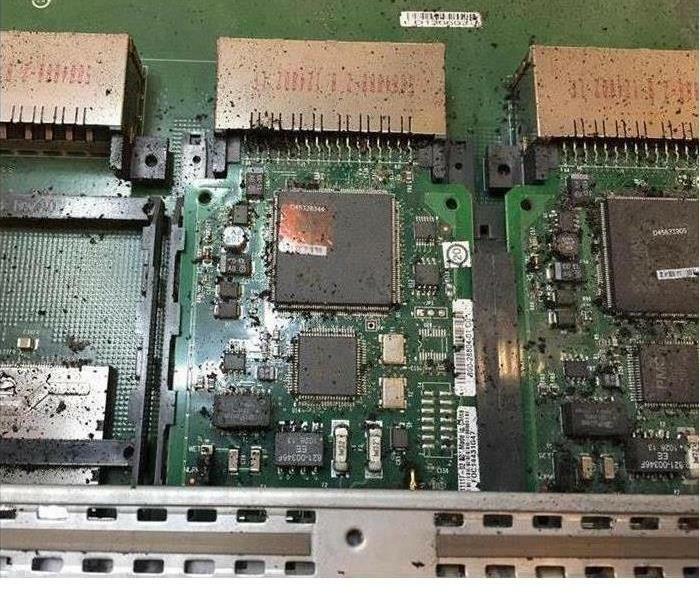 After a small electronic fire, SERVPRO has special cleaning techniques they can use to clean and restore the electronics back to working conditions. Contact us 24/7 for your fire restoration emergency. This is the after product of professional carpet cleaning after a water loss. The team at SERVPRO responded and professionally cleaned and dried the carpet. They used air movers to dry quickly preventing future damages. 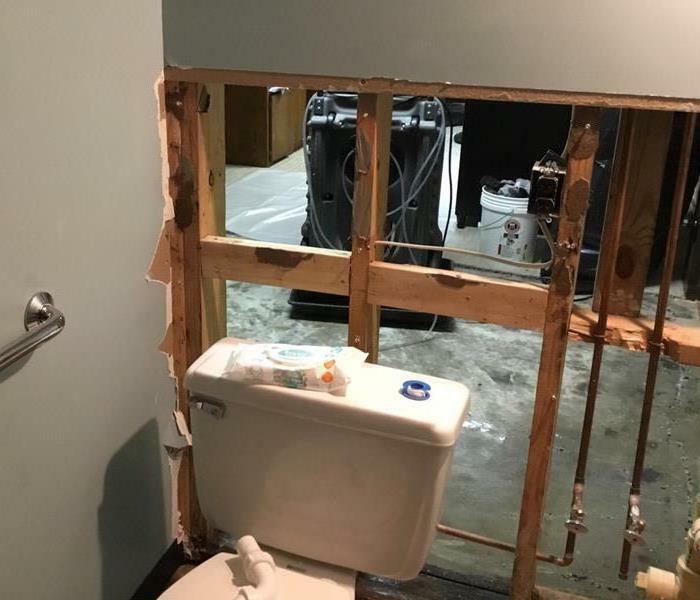 After a pipe break, this office suffered from a water loss. 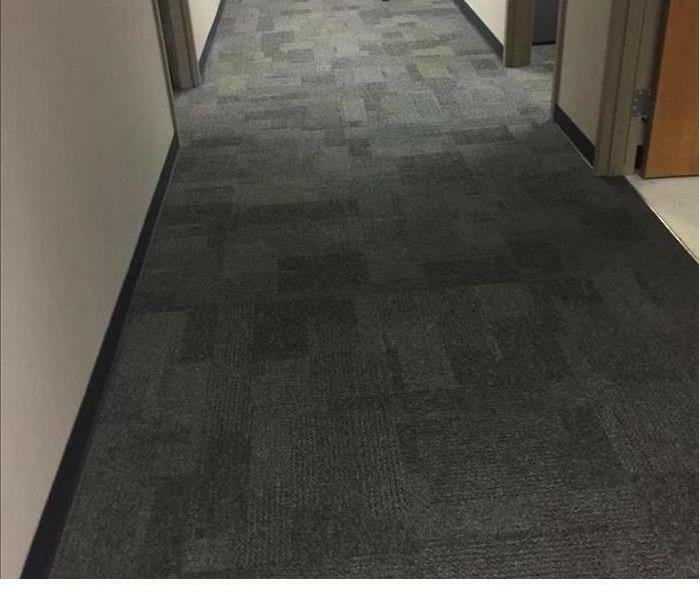 The water had flooded into the halls. 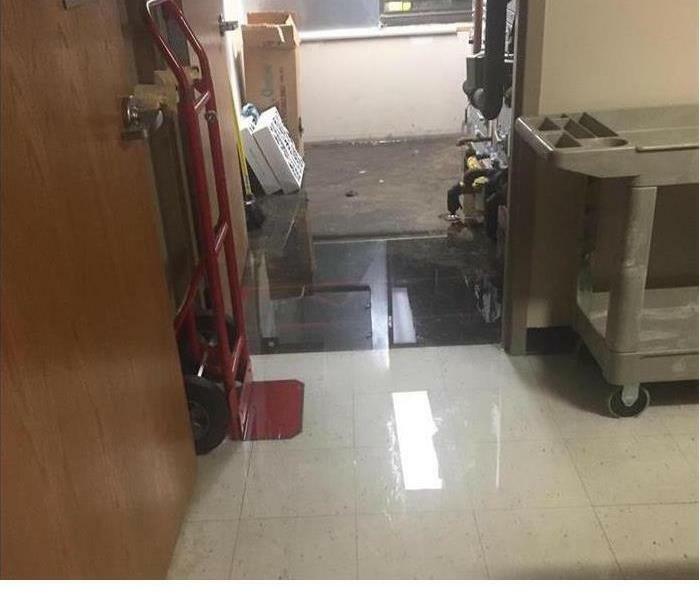 SERVPRO responded and extracted the water from the office and halls. Contact us for your water mitigation. The dining room in this image was one of the several rooms affected by a large water loss that happened in this home. The quick response from our team was greatly appreciated by the homeowner. 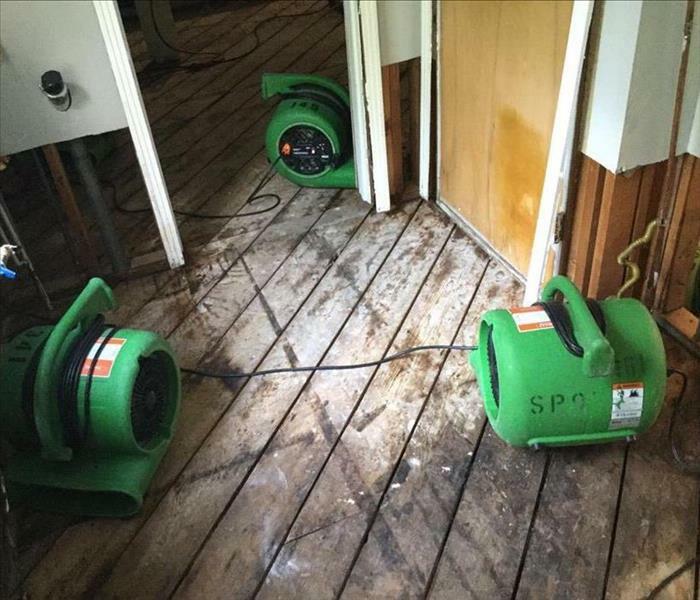 When this home was impacted by a water loss, we brought in the equipment you see pictured here to help with the drying process in order to prevent secondary damage such as mold from occurring. A local Shawnee office building had a pipe burst and it took them almost 2 hours to find the water shut off valve. We were on location within 45 minutes of being called and assisted them in locating the valve to prevent any further damage. This is why ERPs (Emergency Ready Profiles) are so important, they help all employees locate important shut off valves. 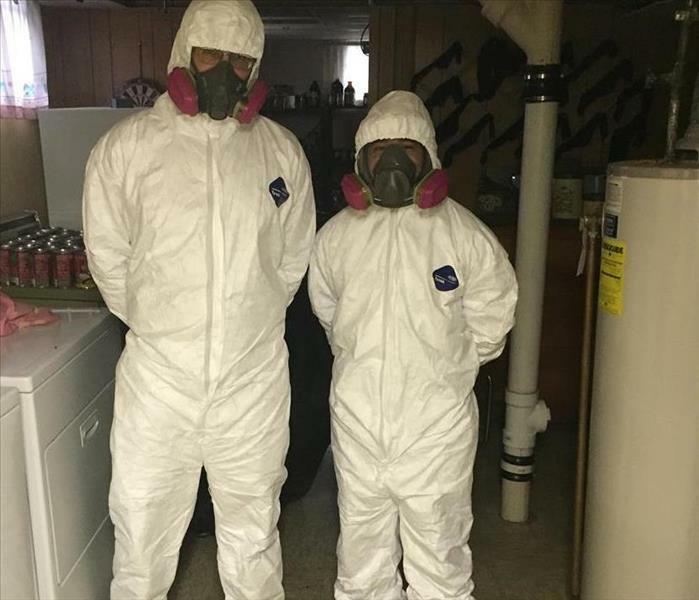 Two of our techs posing in their PPE (Personal Protective Equipment) worn to minimize exposure to hazards that cause serious workplace injuries and illnesses. PPE may include items such as gloves, safety glasses and shoes, earplugs or muffs, hard hats, respirators, or coveralls, vests and full body suits. 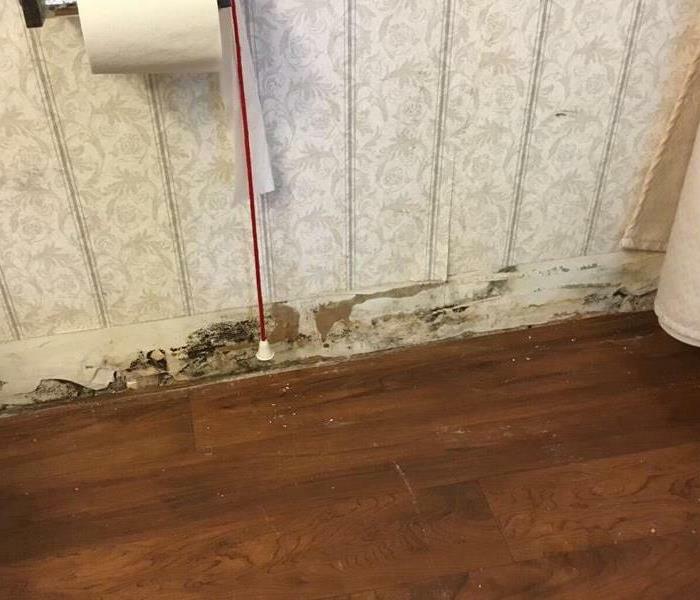 This photo is an example of how in select water damage situations SERVPRO of Greater Shawnee/Merriam are able to remove the vinyl molding at the base of the wall and drill several 1/2" holes every foot along the base of the wall. Air movers are then placed along the wall blowing drying air. This helps increase circulation within the wall and speeds up the drying process while avoiding cutting into the drywall. When the area is completely dry it is easy to repair the holes and replace the vinyl molding. Last year SERVPRO expanded and built a second warehouse. 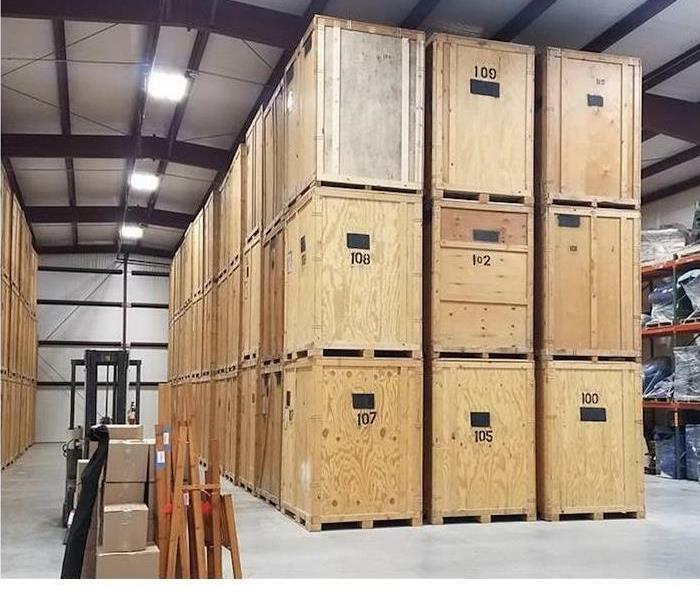 This new addition has more than doubled our original storing capacity and made it possible to take on more jobs that need larger amounts of contents cleaned. 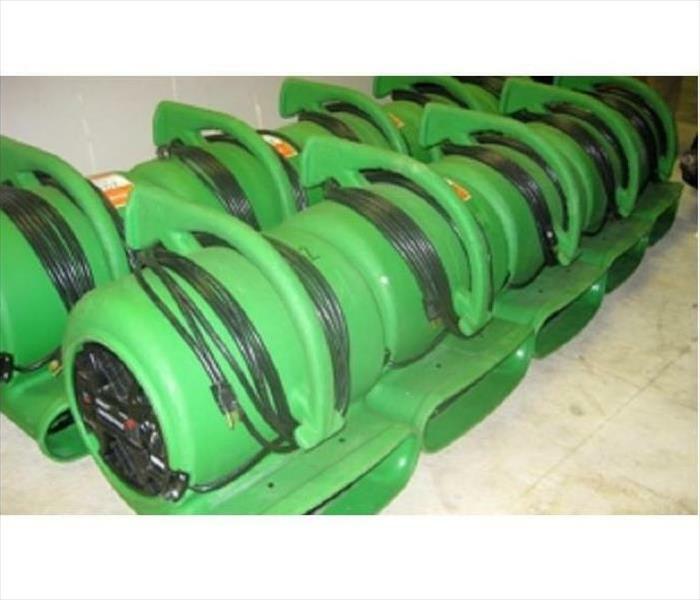 Air movers are industrial fans used to speed up the drying process in a home or commercial property with water damage. More powerful than your standard box fan, these devices are created to move airflow at a high-velocity which will dry water damaged areas more quickly.